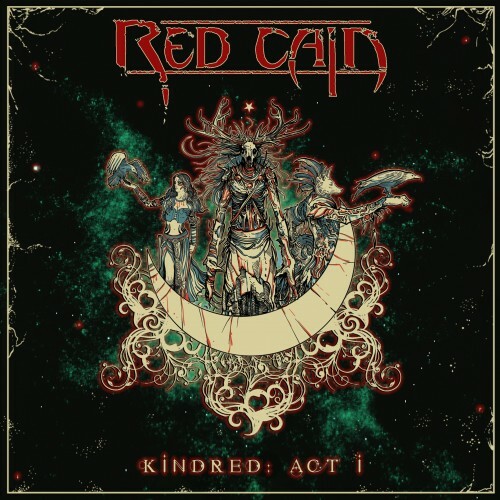 Red Cain is a Canadian progressive metal band formed in 2016 and after releasing a few singles and an eponymous EP the band have now brought out their first album. It’s an independent release that we received from our Canadian comrades at Asher Media Relations. The album begins with “Snakebouquet,” a great six-minute opener in which you can quickly hear the four main elements of Red Cain’s style: long sections of epic progressive guitar riffs founded on a layer of blood-pumping drum work and often cooled down with relaxing keyboards and all narrated by power metal inspired vocals. Personally, I feel that Red Cain’s singer Evgeniy has a similar style to Blind Guardian’s frontman Hansi Kürsh. A slow, powerful and commanding voice, who mainly sings in a operatic style but with some occasional guttural or soprano lines. The album’s second track, “Midnight Sarabande,” starts off gently with the guitars and drums looming in the background until they finally burst out to the foreground. The song has a nice contrast formed by Evgeniy’s emotional voice and the more furious beats that play alongside him. Then comes “Zero,” a ballad that begins with a dreamy piano and keyboard session before the song becomes an epic guitar barrage featuring beautiful vocals and both a keyboard and a guitar solo section (in particular the latter is quite breathtaking)! Up next is “Blood & Gold,” another slow, introverted track this time with plenty of acoustic guitar and some operatic high-note singing. This alongside the piano, keyboard, moody vocals as well as another impressive ending guitar solo just as it was in the earlier track. Then comes my personal favorite song on the album, “Juliet!” A heavier track both in beats and vocals and a large emphasis on keyboard tunes, giving this song an almost industrial metal atmosphere. But this track’s main attraction is the catchy chorus, especially the way how Evgeniy roars out the song’s title is mesmerizing. Shakespeare would be proud! Following up is “All Is Violence,” which enters the stage with a short black metal section before the band goes back to their progressive power metal glory for another soaring track! And finally we’ve got Kobra Paige (from Kobra And The Lotus fame) joining in for the final song, “Wing Of The Crown,” adding her high, angelic vocals to complement Evgeniy’s lower-pitched singing style. Sometimes one of them takes the lead while you can faintly hear the other vocalist echoing in the background and during other parts of this six-minute track both Kobra and Evgeniy sing in duet. This song’s melodies themselves are a mix of everything heard throughout the album and this all adds up to a beautifully crafted finale.